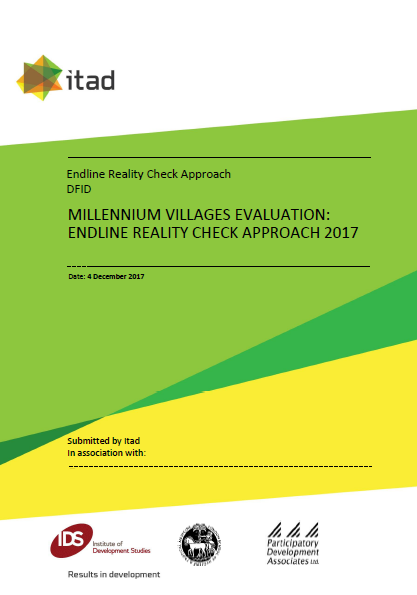 The endline Reality Check Approach (RCA) was conducted as the last of the monitoring and evaluation elements of the Independent Impact Evaluation of the Millennium Villages Project (MVP) commissioned by the UK Department for International Development (DFID). It was undertaken in July 2017, six months after the MVP closed. This was the third round of RCA study (baseline conducted in February/March 2013 and midline in May 2015). This particular report focuses on the changes which people have experienced since the midline study was conducted in May 2015 and the overall changes experienced since the start of the MVP. It purposely takes the position of people themselves in looking at change and complements this with first hand observations and experience of the researchers from spending four days and nights living with families in the villages. Read the full report, executive summary, briefing papers and other annexes on our resources page.